Bebebums is having its first ever seconds sale on its cloth diapers. 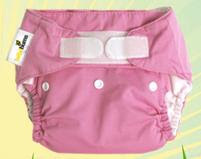 The Bebebums seconds diapers have minor flaws but are as good as any other Bebebum diapers, at a super price: just $10! There are 6 colours available, and every diaper comes with 2 inserts. Shipping for 1-3 diapers starts at $10 plus tax. 0 Response to "$10 Cloth Diapers at Bebebums Seconds Sale"